The protected National Park of the Similan Islands provides an opportunity for the ultimate Thailand diving holiday. Cruise along the world famous nine Similan islands and head North to the amazing Koh Bon and Koh Tachai. 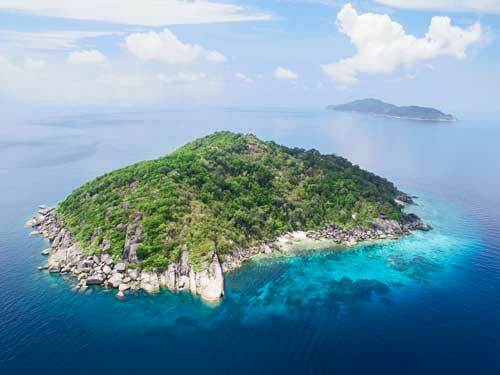 Furthest North, the Surin islands are home to Thailand’s most famous dive site; the stunning Richelieu Rock. The visibility, marine diversity and quality of diving in the Similan Islands is unparalleled elsewhere in Thailand. Diving day trips and overnight stays are available from Tap Lamu and Ban Nam Khem pier in Khao Lak. However, the best way to see all these stunning islands is by joining a Similan Liveaboard. Most liveaboards depart from Khao Lak, but a few depart from Chalong pier in Phuket. Below is a comprehensive guide of everything you need to know about Similan Islands diving. Our interactive maps are best experienced on a large screen. For a mobile friendly list of all Similan dive sites please click here. Similan Diving provides opportunities for all levels of divers. Beginner divers will find countless colourful creatures they have never encountered before. Turtles, Seahorses, Clownfish and dozens of beautiful reef fish reside on lively, multicoloured coral colonies. January to April is typically the best conditions and the greatest chance to encounter Giant Manta Rays and Whale Sharks. Experienced divers will see the best dive sites in Thailand, from the comfort of a beautiful boat. Dive in calm, crystal clear waters on shallow sloping reefs, or at huge granite boulder pinnacles with strong currents and an abundance of life. Spend the rest of your time cruising around paradise islands, walking on fine sandy beaches and eating delicious Thai food; the best food in South East Asia. There are many wonderful dives in the Similan islands, but not every dive is suitable for every diver. Some sites are more challenging than others, as currents can be strong. Browse through the individual dive sites to find Similan diving locations suitable for your experience level, or contact us with any queries. People assume the devastation caused on the mainland by the 2004 Tsunami would have had a similar impact on the Surin and Similan Islands. However, damage to the islands was limited and has not had much of a long term effect on Similan diving conditions. When the wave passed by, it was in much deeper water and still in its swell stage. The wave did not break until it reached shallower waters. Boats out in the open ocean simply floated over the top of it. Divers, in the water at the time, claimed they did not realise the severity of it. The depth instantly changed by a few metres and computers seemed like they were malfunctioning as they started to beep all at once. Divers were aware that something was off, but none knew the reality of what they had just experienced. The Similan and Surin Islands were flooded by the wave rather than hit by its full force. This means most of the damage on land was salt water damage. Plants died and buildings were ruined, but there were no fatalities reported. Underwater, the most noticeable impact was on coral heads larger than 3m in diameter. The Similans had not developed protection from such powerful surges (from events like cyclones) and were prone to being toppled over. Thai authorities were quick to react. They sent divers to turn over the dislodged coral heads, concrete sea fans in their original position and reset table corals. Coral damage from the Tsunami is no longer that recognisable. That is not to say the the reef is perfectly intact as there are other factors that influence the health of a reef. Ocean acidification, pollution and coral bleaching are today’s greatest threats to coral reefs worldwide, not only the Similan Islands. Coral reefs provide both food and shelter for much of the Ocean’s marine life. 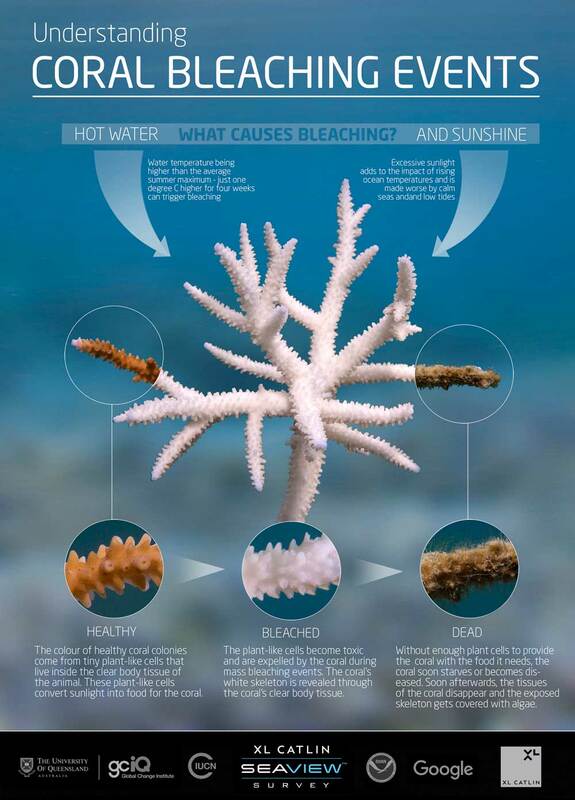 Bleaching is the process of corals expelling their life sustaining algae, turning white, and eventually dying. Similan diving conditions have been affected by several coral bleaching events. This had a large impact on the reefs. However, ongoing recovery and new types of more resilient corals have been growing in the Similans for many years already. For a detailed summary of the most up to date Similan diving coral bleaching conditions, please read the three tab sections below. Coral reefs are to the ocean, what an oasis is to the desert. They make up only 0.1% of the Ocean floor, but are home to roughly 25% of all marine species. Global warming and ocean acidification are considered to be the largest threats to coral reefs worldwide. Coral bleaching is the process of corals losing their colouration and turning a brilliant white. As sea temperatures rise, corals expel life sustaining algae growing in their body tissue, as the algae begins to produce toxic compounds. Coral bleaching is fatal if the coral lives without this algae for long enough. If temperatures drop quickly, the algae can return. If it stays too hot for too long, the coral will eventually die. The effects also depend on how healthy the coral was beforehand. If factors like fishing, pollution and human interaction are controlled, the damage will be minimized. Oceans have absorbed 93% of heat caused by climate change, meaning these events are happening more regularly. Mass coral bleaching is when entire reefs are affected by bleaching and not just individual species. 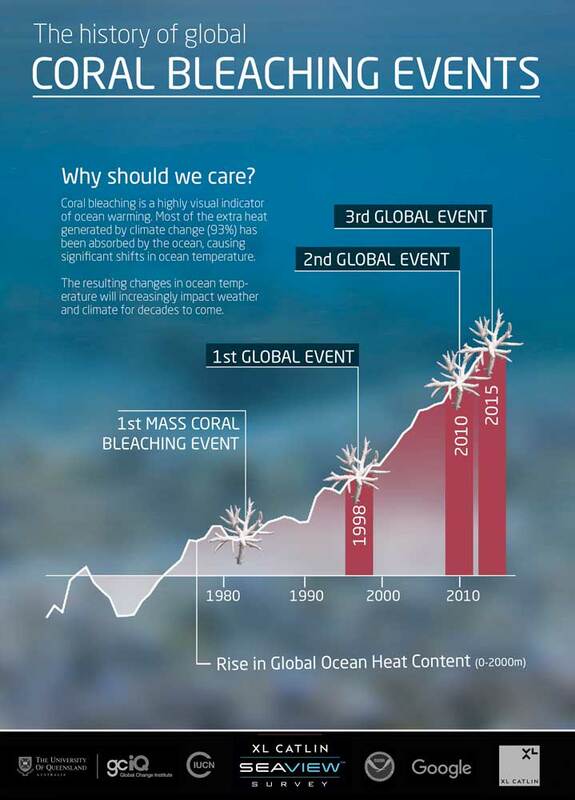 Global coral bleaching is when temperatures are raised high enough for mass bleaching events to occur worldwide. So far these events have only ever been triggered by ‘El Niño’. The first was in 1998, the second in 2010 and the third in 2015-16. The 2015/16 Global Coral Bleaching event was the first to span several seasons. It was by far the longest, but has had surprisingly little impact on the Similan Islands. To find out why, open the next tab. Coral Bleaching in 1991 and 1995 affected the Andaman Sea, causing approximately 10% fatality at most sites in the Similans (Chansang et al,1999). Surprisingly, the much larger Global Coral bleaching of 1998 did not have so much of an effect. Cool upwellings prevented the temperatures from rising too high and damage was minimal. The Global coral bleaching event of 2010 was the most severe on record. Live coral coverage in the Similans dropped from roughly 65% in December 2009 to only 25% in November 2010 (Klinthong, 2012). This forced the closure of several dive sites, some of which are still closed today. Some dive sites were affected a lot worse than others. The entire Andaman Sea was affected to some extent. Prior to Global bleaching events, the coral in the Similans was healthiest and most abundant on the sheltered sloping reefs on the East side. The East side was home to some of the areas most affected dive sites. Sites such as East of Eden (Similan Island #7) are still closed. Contrastingly, the West side is recovering at a much quicker rate. Between 2010-2015, there was much improvement and coral growth on many dive sites around the Similan Islands. The West (left) and East (right) of the Similans are just a few hundred metres apart, but are subject to very different conditions. The LAIW (Large Amplitude Internal Waves) arriving on the West have helped coral regeneration a lot more than the shallow reefs of the East. Conditions on the East and West of the Similan Islands are dramatically different. The islands sit close to the Thai continental shelf, which puts them in close vicinity to a dramatic change in sea depth. This is one reason for the fantastic visibility. As water movement passes over the continental shelf, there are strong cold upwellings that cause huge waves under the Ocean’s surface. These are known as ‘Large Amplitude Internal Waves’ (LAIW). These huge sub-surface waves travel for great distances, bringing cold water into shallow coral reef areas. Because of the position of the islands, these LAIW all hit the Western side of the Similans. Divers refer to these LAIW as ‘Green Monsters’ due to the rapid drop in temperature and visibility in such a short space of time. You can see large walls of green water approaching the dive sites whist you are on a dive. These ‘Green monsters’ seem to be having a positive impact. The LAIW are regularly supplying cool, nutrient rich, water to the West of the Similan islands. This exposes corals to dramatic changes in temperature and seems to be promoting a new type of more resilient coral growth. Coral exposed to substantial temperature fluctuations can potentially be made more stress-resistant. Studies have shown corals on the West side of the Similans have already built up a much higher resilience (Wall et al, 2014). During the most extensive and longest lasting Global coral bleaching event in history (2015-16), there has been surprisingly little bleaching on dive sites around the Similan Islands. This is during a time when the largest living structure on Earth, the Great Barrier Reef, is dying at an alarming rate. Currently A large amount of coral found in the Similans is relatively young and has grown since the bleaching event of 2010. It has already been proven that some of these corals, particularly those exposed to the LAIW described above, are already more resilient to fluctuating water temperatures. It is possible the Similan Islands are beginning to withstand stressful conditions and are able to continue their ongoing recovery. When the National park closed for the South West monsoon in May 2017, the coral reefs in the Similans were at their healthiest since 2010. Similan diving currently appears unaffected by the 2015 Global bleaching event, but this could change. We will continue to update this section as regularly as possible. As a diver, one thing is clear. If you want to see beautiful and diverse coral reefs anywhere in the world, you need to come and see them soon. They may not be here forever. As a society, the best thing we can do is work to reduce global warming. However, as an individual diver, the best thing you can do is act responsibly. As has previously been mentioned, coral bleaching is made much worse on a reef that is already under stress. Pollution and human interaction have very damaging effects, so here are a few things you can do to help on your Similan diving trip. Do not feed the animals. Fish are unable to digest many foods and this causes internal damage. Turtles can be attracted to boats and are at risk of injury from propellers. Do not apply sunscreen before entering the water as the chemicals are toxic to the reef. Do not touch the coral. Oil residue from our skin damages delicate coral polyps. Be careful of your fins. Do your best to maintain good buoyancy, and if you are not so confident with your diving ability, stay a few meters back from the reef. Lastly, the Similan Islands are under the protection of Thailand’s National Park status. If you see any tour operators or tourists breaking the rules of the national park then please report it. If everyone acts with the same level of responsibility, we can work together to preserve the reefs. Diving alongside the magnificent Richelieu Rock in 2016. Corals are colourful and plentiful. Marine life is diverse. The Andaman Sea is still home to the best diving in Thailand. The Similan Islands provide one of the best diving experiences in Thailand. Located way out in the Andaman sea, next to the Thai continental shelf, a constant supply of cool deep ocean water almost guarantees great visibility. The iconic granite boulder formations create uniquely beautiful island shapes sitting on the horizon. Cruising along a paradise archipelago, on a beautiful boat with delicious food, makes for a perfect Thailand diving holiday. Similan diving conditions are best from January to April. This is your best chance to dive with Giant Manta Rays and Whale Sharks. Anytime of year its possible to see Dolphins jumping alongside your boat. A turtle Sanctuary on Similan Island One helps boost a healthy population of Hawksbill and Green Turtles. An abundance of reef fish splash colour on every dive site. Seahorses, Ghost pipefish, nudibranchs and much more macro life are all hiding in the cracks, waiting to be discovered. The coral reef is in a healthy state of recovery at a time when other reefs around the world are in decline. The coral bleaching of 2010 has spawned a new breed of resilient coral left unaffected by more recent bleaching events. The coral may therefore not be the largest in the world, but this is a chance to see a relatively unique underwater phenomenon; new life! The coral has been in a state of rejuvenation for six years already and only continues to grow better. A Similan Liveaboard is a trip for those that want the complete Thailand diving holiday experience. The most important part of each day may be the four hours you spend underwater. But, with our help you can find the perfect boat, where you can enjoy every aspect of your holiday from the moment the sun rises to when your head hits a comfortable pillow. If you are strapped for time then there are also plenty of options for day trips. Any Similan diving trip will almost certainly be the highlight of your Thailand diving holiday. The Similan islands offer a large variety of dive sites with very different topography and conditions. Dive sites on the East of the Similans, like Anita’s Reef & Breakfast Bend, are protected, shallow sloping reefs and perfect for beginners. On the West are more dramatic granite boulder dive sites such as West of Eden. For Granite Boulder dives in the Similans, there is none better than the more challenging and exposed pinnacles of Elephant Head Rock. The dive sites get even better as you travel North. The Limestone island of Koh Bon has a long shallow wall and a huge ridge that has been proven to attract Manta rays more than any other dive site in Thailand. Koh Tachai is the most exciting dive in the area with massive schools of highly active fish, potentially strong currents and a decent chance for Whale sharks and Mantas. Dive sites like the Boonsung Wreck offer diving in ‘Fish Soup’. Then last, but by no means least, the stunning Richelieu Rock! Use the gallery below or the interactive map at the top of the page for the definitive Similan diving guide.